Garrard Labs was a Company that between the 60s and the 80s designed and built many turntables and some of these are considered, even today, nice examples of high precision craftsmanship and of a serious think different approach. Two examples are the well-known Garrard 301 and 401, very popular today thanks to the slate plinth designed and built by Slate Audio in the UK. You can see a picture of the Slate Audio Garrard 301 below. But I'm not here to tell you about some hard to find pro turntables of the past, I'm here to tell you something about an easy to find Garrard of the Seventies, sold almost everywhere in the World in large quantities. It is the Garrard Zero 100 SB, a very good looking turntable which had some keen features that I'll try to tell you in this article. The Garrard Zero 100 SB was introduced in 1970 (that's almost 30 years ago...) and quickly become pretty popular thanks to the looks and to the affordable price, slightly more expensive than the Thorens TD 166 and TD 145 of the time (here in Italy, at least), just to give you an idea. First of all it is a belt driven turntable with a metal subchassis suspended on four soft springs. These springs are damped by an internal soft foam (usually green) and two of these are adjustable from above simply using a screwdriver. The motor is a synchronous Syncro-Lab made by Garrard, very reliable and silent. The one-piece platter is quite heavy and it houses the bearing for the spindle, the latter being secured to the floating subchassis. Not exactly a bearing, it is simply a precision polished metal housing for the spindle. The central part of the platter that houses the spindle can be taken apart by simply unscrewing three bolts. This is a very useful feature that allows the owner to control the shape of the housing (to see if it has been damaged or not) and clean and lube it if necessary. The Zero 100 SB can work either as a fully automatic turntable or like an audiophile manual one. The automatic part is a complicated fully mechanical system of coils and shafts that works surprisingly fine and silent. Of course we audiophiles prefer to use it as a fully manual turntable. Speed change (33-45) is controlled by a shaft that modifies the position of the belt on the motor spindle. Since there's no pulley the motor spindle has two different diameters, which is a clever solution because of the reduced rotating wight (faster start up) but a bad system for it causes the belt to slip too often. So the start up time is just fair, a feature that at the times wasn't much appreciated and that we modern audiophiles can easily bear. The motor is isolated from the chassis via three rubber washers. As usual in the 70s turntables the Zero 100 SB had an ugly rubber mat, responsible, partially, for the sound quality of this TT, as we'll see in a separate article. The turntable seems very solid and reliable and the quality of the craftsmanship is very good, especially when related to the price of the TT. In other words the shell is free to rotate around the two parallel arms in a way that it always remains in the same position. Neat. To be honest this design wasn't invented by the Garrard Labs: it was a design by Burne-Jones & Co. LTD., an English Company that back in the 50s designed the famous B.J. Parallel Tracking Arm that you can see in the picture below, taken from an original brochure of the time (click above the picture for full-size resolution). Before you ask: why such a clever idea hasn't had any success at all? Well, there have been many reasons: first of all the parallel tracking arm was expensive and complicated. In order to make eveything work fine hi-precision bearings should have been used...but these were expensive (and, in the 50s, almost unavailable) so the designers decided to use lower quality bearings, with the result that the arm isn't exactly rigid especially when compared to standard arms. Then the arm was heavier and weaker than the usual arms of the time...today it would be possible to design and build a better parallel tracking arm...but we're living in a digital era so there's no hope, I'm afraid. 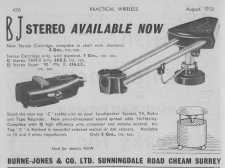 The Garrard Zero arm has other interesting features: for example the antiskating, different for conical and elliptic stili, is magnetic while some TTs of the time still used a complicated system of weights and counterweights, think for example at the Thorens arms. The arm lifter is hydraulic and its height is easily adjustable. Even the arm locking device is a clever design: an aluminium little tower locks the arm from below with no possibility of human :-) error. The counterweight is isolated from the arm tube via a rubber damper while the tracking force is easily adjustable via a weight sliding on a gradued scale along the arm. A drawback of this arm is the pick-up shell, made of two pieces (one sliding into the other), very easy to use but very weak, so that it doesn't offer to the cartridge a stiff mounting surface, which is a must for today's standards. It should be said also that, despite the mechanical complexity of the arm, the horizontal and vertical friction are unbelieveably low and it seems very light at touch, too. This turntable is easily available and thanks to its low attitude to be used professionally (I mean, it is not a TT for deejays) the Garrard Zero 100 SB, if survived during all these years, it should be easy to find in good working conditions. The owner of such turntable used it for playing Music at home the 99% of the times. A mint conditions Zero 100 can be payed even 100$ but please refuse to pay more. Mine has been payed around 15 $ but it was almost destroyed. Rust was almost everywhere, the wood plinth was scratched and the cables (even the mains!) weren't connected so that I wasn't able to test it. After a couple of days of work I fully disassembled it and restored to its origional conditions, like it was brand new. My wife saw it when I bought it (and asked Are you seriously going to buy this junkyard stuff?) and then after the restoration was complete. Now she admits this turntable is one of the best-looking HiFi components in our house (and I have soooo many things :-) ). A fully restoration job like the one I did isn't just for everyone: you need to know WHAT to do and HOW to do this. A simple mistake and your turntable is ready (seriously) for the junkyard. But normally you're not required to fully disasseble your turntable: just buy something that works, even if in need of some minor retouchings. The arm bearings and articulations. Check for the free play, too much of this and the arm is damaged and there's little to do to fix this problem. The subchassis coil springs. Check if these are in good conditions, possibly if they still include the foam damper. The spindle. Carefully inspect it for any scratch or sign of misuse. Try to spin the platter to see if it oscillates with respect to the plane of the subchassis. If the platter oscillates, your turntable is ready for the junkyard. The motor. This is one of the most reliable and hard to find parts of this turntable. Carefully inspect the motor spindle and check that this spins free and without excessive vibrations and noise. The belt. Don't worry if this is worn or broken, a second hand (or even new) belt can be found easily. You can also build one on your own. Ask for a listening test: this is the only way to check if the wiring from the cartridge till the RCA sockets is OK. Restoring this wiring can be painful and certainly not easy task for everyone. This is the first chapter of my Garrard Zero 100 SB saga. In a separate article you will find a listening test of this beauty of the 70s. In another article I describe which kind of mods and tweaks can be successfully applied to this turntable (and not only to this one) so to see how the sonic quality can be improved till modern standards. None of these tweaks will modify the exterior looks of this turntable which is, IMHO, so nice to see that any aesthetical modification would be a crime.